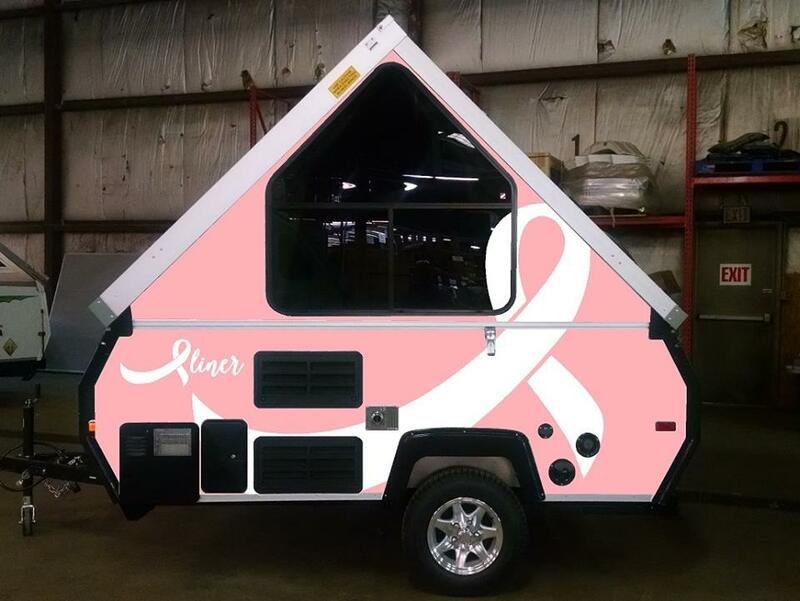 In a press release from Mount Pleasant, Pennsylvania based Aliner, they will be launching two new designs for their Scout-Lite and Ranger 10 trailers, with a portion of the proceeds to benefit breast cancer research. With October being breast cancer awareness month, the announcement was no coincidence. The two color options will be pink on white, or white on pink. The designs were the inspiration of Aliner president and CEO Brett Randall, who has had personal experiences with breast cancer. According to the press release, as the project proceeded, it became evident that breast cancer touched the lives of many Aliner employees. Several concepts were considered over a period of months before these two designs were chosen, as they believed they represented the Aliner brand and breast cancer awareness. One touch I noticed is how they incorporated a ribbon as the “A” in Aliner on the sides. Nicely done. 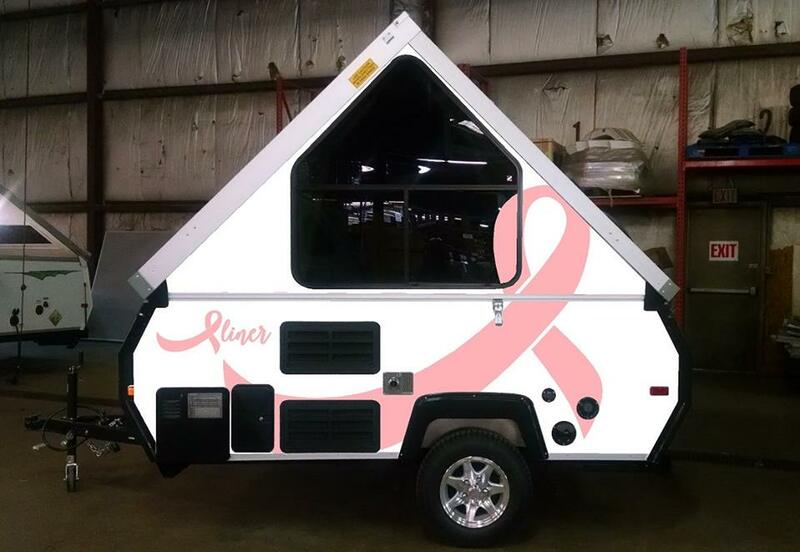 The breast cancer awareness camping trailers can now be ordered via a local Aliner dealer. A couple of weeks ago I was able to get a tour set up of the Riverside RV factory in LaGrange, Indiana, thanks to a one of Riverside’s dealers, Austin Braun of Braun’s Fun Time Campers in Indianapolis. I was interested in checking out their facilities for a couple of reasons. First, I’ve been following Riverside’s steady growth since I first found out about them at the RVIA trade show in 2011. 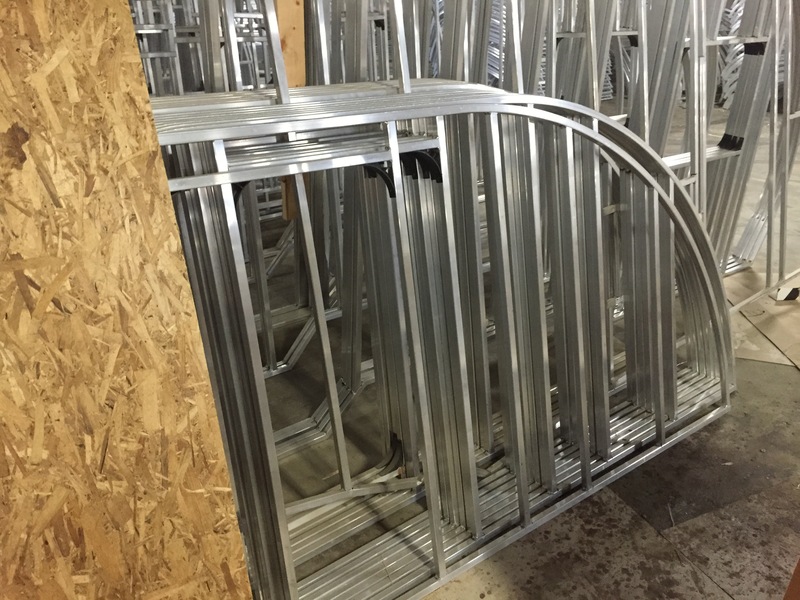 The second reason has to do with an order I made for one of their teardrop trailers. I was hoping to see it in production, but it wasn’t slated to hit the assembly line until August 29. I’ll cover that in a future post, but here’s a sneak peek at what it’ll look like, as there was one on their lot awaiting a trip to a dealer in Sacramento. My tour was led by Riverside sales manager Bob Taulbee. On the Friday I was up there, they had finished production for the week, so it was just about empty except for a handful of office personnel. Bob told me Riverside consists of about 50 employees, and about 45 of those are local Amish. Despite the production having been wrapped up for the week, Bob told me that they’re producing about 40 units a week. That’s some pretty impressive output for a smaller independent RV manufacturer. Right now there are just under 600 Riverside Retros listed on rvtrader.com, so that’s pretty good coverage for anyone looking to buy one from any part of the country. Ever since 2011 when I first laid eyes on a Retro 155, the quality has vastly improved. One aspect of that better quality is in some of the little things they do. One such example is in leak testing. Each unit that is produced spends about 5 minutes in the shower, where water soaks each trailer from various angles while one person inspects from inside. When I brought up the topic about Little Guy soon reviving the Serro Scotty line, Bob made no bones about it. “We know they’ll be coming after us”. Despite their market share of retro style trailers facing this pending threat from the coming of Serro Scotty, Bob feels good about where they stand in the market and the continually growing base of Retro owners who seem to be quite satisfied camping in their Retros, according to some of the Riverside Facebook pages out there. The back lot at the Riverside factory is a nice array of just about every model they have available. These are completed models awaiting shipment to dealers all across the country. That includes even some of the newer models, such as the new Retro toy hauler that’s just coming out. One last thing I was intrigued with during my visit there was a new project Riverside is coming out with that will debut in September. And that is a Retro fifth wheel. Granted, it doesn’t fit the criteria of a small trailer, but once I saw it, I was more than wowed by it. It’s the first prototype and was still a work in process when I saw it. They didn’t even know yet what it’ll weigh or the MSRP on it. However, it’ll have the same retro interior and graphics as their other models…plus baby moon hubcaps. If you’d like to check out more of the Riverside Retro models, you can visit their website at http://riversidervs.net.